named after you or a loved one! 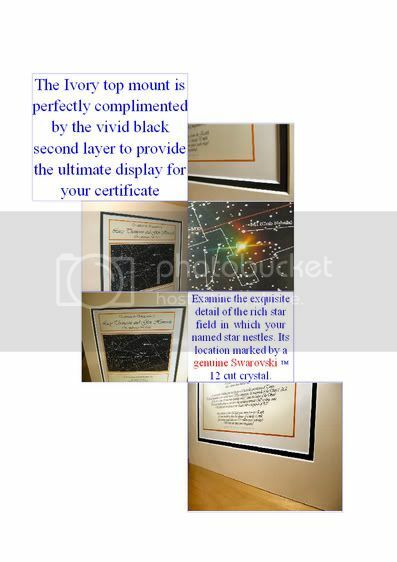 Fascinating information regarding your named star, its closest galaxy and the incredible distance from Earth are all beautifully presented on your certificate. It is perfect for that 'difficult to buy for' person in your life! of all ages fascinated by space! Don't own a telescope or have access to Jodrell Bank, Arecibo or the Very Large Array in New Mexico? All stars are visible with the naked eye! That's not all, details of your Name a Star with a genuine Swarovski crystal will be sent into the heavens for eternity! The actual details of your Name a Star will be sent into the heavens in a real rocket as part of a specially commissioned private digital payload. Blast off is scheduled for late 2007. All recent purchases of Name a Star with a genuine Swarovski crystal qualify for inclusion in this extraordinary journey! Let us know by email the name or dedication exactly as you want it to appear on the certificate and we will do the rest! For the best friend / Mum / Dad in the Universe! We are delighted to accommodate your request, at no extra charge. For an extra touch of romance, why not add two names to your certificate? Over 1400 have been received from delighted customers worldwide. We recommend that your purchase is framed in order to achieve the maximum visual impact. We have found that a plain black frame works best! Your certificate size is: 11 x 14 inches. The actual details of your Name a Star will be sent into the heavens in a real rocket as part of a specially comissioned private digital payload. Blast off is scheduled for late 2007. All recent purchases of Name a Star with a genuine Swarovski crystal qualify for this extraordinary journey! This product is offered for sale as an individually personalised novelty certificate and as such refunds will be limited to replacement only. Upgrade to a real diamond for just £40.00 more, let us know by email. For your guarantee of authenticity, your Name a Star certificate will be registered with the Enregistrement Stellaire Universel de Fonctionnaire.